During an afternoon ceremony at the Indiana State Fair on Friday, Aug. 15, W.F. "Bill" Wellman of Valparaiso was recognized by Lt. Gov. Sue Ellspermann for his dedication to Northwest Indiana&apos;s tourism industry. Ellspermann presented Wellman the prestigious Will Koch Tourism Leadership Award, Indiana&apos;s highest tourism honor. Wellman began his more than 50-year career working at a family-owned tavern in Valparaiso before serving as a Marine during World War II. Upon his return, he managed and owned several attractions. Wellman participated in the design, implementation and opening of the Holiday Star Theatre in Merrillville, and served as general manager of the theatre for the first 2.5 years of operation. Wellman has served the Northwest Indiana community in numerous ways. While running the Bridge VU Dinner Theatre in Valparaiso, Wellman hired acting students from Valparaiso University to serve as entertainment for patrons. Recently, Wellman oversaw the installation of sound systems throughout the region that play "Taps" at dusk. In addition to serving as the senior vice president of communications for Whiteco Industries, Wellman is the vice chairman for the South Shore Convention and Visitors Authority&apos;s board of directors and has served on many other boards through the region and Indiana. In 1972, Wellman was awarded the "Man of the Year Award" from the Indiana Restaurant Association, and was inducted into the group&apos;s Hall of Fame in 2002. In 1986, he was named the Indiana Ambassador of Tourism. Additionally, Wellman received the Citizen Square Award, an award used to boost awareness and motivate good citizenship in downtown Valparaiso, and was named one of the South Shore Convention and Visitors Authority&apos;s 30 Faces of Tourism along the South Shore. According to Speros A. Batistatos, president and CEO of the South Shore CVA, Wellman has been an instrumental force in Northwest Indiana&apos;s tourism industry. "Mr. Wellman has long been a mentor of mine, as well as numerous others in Indiana. He truly understands what it takes to be successful, whether it&apos;s owning and managing a popular area attraction or providing a powerful and meaningful experience at a destination," explained Batistatos. The Will Koch Tourism Leadership Award is awarded annually. The award&apos;s namesake, Will Koch, was the long-time owner and president of Holiday World & Splashin&apos; Safari. 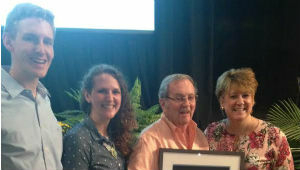 Koch&apos;s family and the Indiana Office of Tourism Development established the honor to pay tribute to Will Koch&apos;s many contributions to tourism, business and society. Wellman and Koch family: Wellman stands with members of the Koch family after being presented with the Will Koch Tourism Leadership Award, named after long-time owner and president of Holiday World & Splashin&apos; Safari, Will Koch.